I received a question on my Facebook page asking what service I used for my website. I liked the question and it made sense to devote a post on the topic. The thing is, there are so many free services available that there is no reason not to put you stuff online. I started my site a few years ago not having any idea what I was doing. It was originally only meant to serve as a means of communication to and from my professors as I researched my thesis over the summer. For some reason, the site eventually morphed into a blog about architectural illustrations unrelated to my thesis. It just sort of happened and I’m glad it did. Even if your intentions are only for the site to serve as a web portfolio, the time it takes to setup a site is minimal. Here are a few suggestions I have about getting your stuff online. VIRTUAL PORTFOLIO: Issuu.com– I have long been a big fan of this site. Issuu is a digital publishing site that allows you to upload a PDF of your portfolio, and turn it into a virtual document that you can flip through via the Issuu platform. It’s a very clean interface and has a ton of options for embedding. A link to your virtual portfolio could be pasted in emails or added to a resume offering an easy way to send others your digital portfolio. One other note about Issuu. 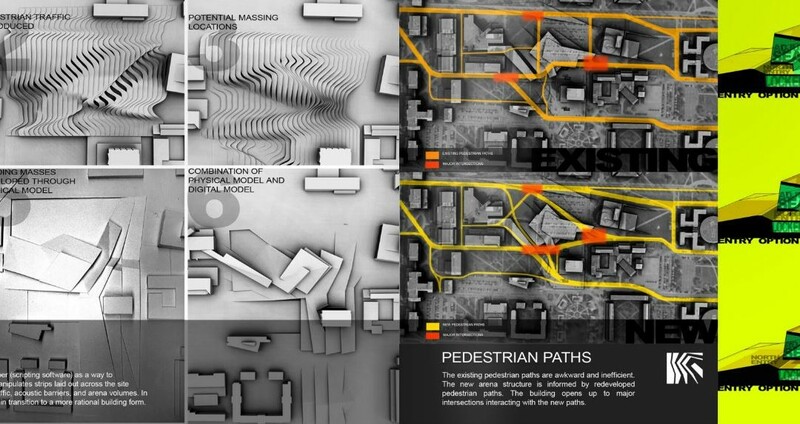 There are already tons of architecture portfolios uploaded which can serve as a great source of inspiration or give you an idea of what kinds of portfolios certain schools are accepting. Below is an example of my portfolio that was uploaded to Issuu and then embedded on this site. BASIC PORTFOLIO SITE: Carbonmade, FolioHD– I see these sites as an intermediate option between sites like Issuu and a full blown website. The features are somewhat limited, but what you do get is an easy-to-navigate site that makes browsing through projects a breeze. I have never used these services personally, but I have friends who went this route and it worked out well for them. BLOGS: WordPress, Wix, Tumblr, Squarespace-There are a ton of free blogging services. A lot of these services have their own platforms and hosting, meaning you don’t have to use programs like Adobe Dreamweaver. Everything is managed online. I use a service called Squarespace. It’s not free, but allows for a high level of customization and is constantly upgrading its platform with new features. What I like about blog websites is that they allow you to express your work similar to the portfolio sites, but in a social way. Architecture is a social occupation, therefore it makes sense to show others that there is an actual person behind the work. If you’re not into blogging, you can still create unique custom websites geared towards only presenting your work in a portfolio style format using these services. The above suggestions are obviously only the tip of the iceberg. The options for getting your work online are only going to increase and it can be a little overwhelming. My suggestion is start simple. Set up a game plan of what you want, and stick to it. This will ensure that you get clear, quality content online in a short amount of time. Congratulation for your very stylish work, both architectural and graphic! And your tutorials are really clever and efficient. YOUR BLOG IS BRILLIANT, LEARNT SO MANY NEW TECHNIQUES FROM HERE. PLEASE KEEP IT GOING. Alex,, Thank you so much for your posts!! This is the best architecture blog I know for far! You've spelt 'definition' incorrectly in your portfolio! This is my first time reading your blog & tutorials and I am fascinated by your professionalism and dedication. I love your tips on portfolio and they are very helpful as I just finished my masters in architecture and am getting ready for interviews. I am still unclear whether one at my position should gave a digital book, to resemble the traditional portfolio or also have a website. If the latter one is the the answer, how do I reuse my digital book portfolio in the website, to save double the work and time? I love your tips on portfolio and they are very helpful as I just finished my masters in architecture and am getting ready for interviews. I am still unclear whether one at my position should have a digital book, to resemble the traditional portfolio or also have a website. If the latter one is the the answer, how do I reuse my digital book portfolio in the website, to save double the work and time? 2. How to Publish Digital Products With PayLoadz? You can just tell me what topic you'd like and I'll do my best to write a catchy and interesting article on it. I am a Journalism Major and like to think I can write fairly good quality articles. If you might be interested in a 3-way link exchange, that would be great too. Just drop me a line at friendslover_2@yahoo.com if you're curious about it. Hello! Yeah squarespace is the best choice for those who need to create a unique blog if they want a reliable hosting service. You know I'm planning to add a blog page to my site http://www.reproschicker.ch since it costs more than the average blog service, the features and hosting options are well worth the price tag. Squarespace is the full blog service package. Wow!Your portfolio is just mind-blowing!Your blog has been a valuable asset for me,it helps so much! !Keep up the good work! I was just looking for portfolio inspiration when i stumbled onto your blog and subsequently your porfolio, and i am stunned. And now nervous. How do you create the abstract base images for working on analysis diagrams..? ?